Sometimes I fly over places and find roads like this that go on, seemingly forever, into the mountains or over the horizon. It always makes me wonder, who uses this road? What do they do out here? This is a small pass that comes down from Mount Potosi in the Spring Mountain Range of Southeastern Nevada. More than likely this dirt road leads to one of the numerous precious metal mines that dot the mountains in this area. Mines with interesting names like: Green Monster Mine, Red Cloud Mine, Oro Amigo Mine, Yellow Pine Mine, Whale Mine, Iron Gold Mine, Bill Nye Mine, Smithsonite Mine, Hoosier Mine, Mobile Mine, Snowstorm Mine, Bluejay Mine, Cosmopolitan Mine, Chiquita Mine, Hoodoo Mine and the good ol’ Accident Mine. There are many many more. In the middle of this image, you can see through the pass to clear blue skies on the other side. Sometimes pilots will engage in what is called “scud running”, which is when you have a could layer in the mountains and you are either trying to get in or out of a valley and there are small gaps alongside the mountains edge where pilots will try to quickly fly through before they close. That is where the trouble happens, so imagine you are flying along in this valley, wanting to get to your destination and being frustrated with a cloud layer you cannot fly safely through. So you fly along looking for a gap – or a sucker hole – that you can pass through. This pass shown in the image is a classic example of a mountainside sucker hole. Then as you begin to fly through it, it suddenly closes up, and you now quickly find yourself in a situation that can become deadly in an instant. Especially if you are in deep mountains! Nothing is worse than smacking into the side of a canyon wall doing 100 miles per hour or more! Goodsprings Valley lays at the foot of Mount Potosi on the left and the Deerspring Range on the right in this image lensed while exploring the Mojave Desert to the west of Boulder City Nevada. This area up at the end of the canyon is called Dead Horse Loop and that is where the sucker hole was as shown in the first image. 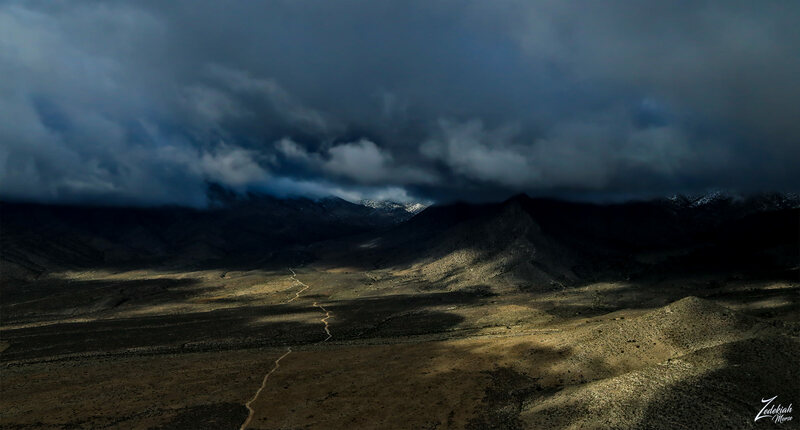 The clouds were backed up against the mountain range and fanned out all across the valley which forced me to fly out and around the weather to get out of this area. 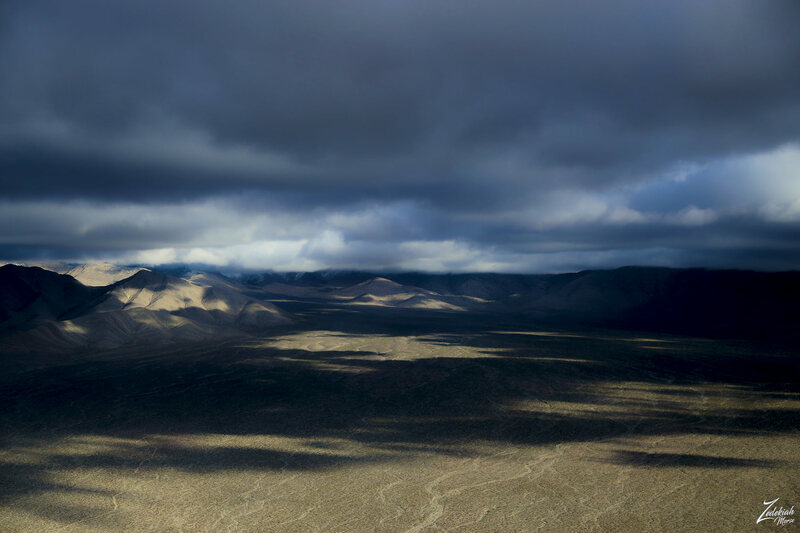 It was a warm spring morning and I was chasing a rainstorm as it moved quickly from the Death Valley area towards the Grand Canyon.